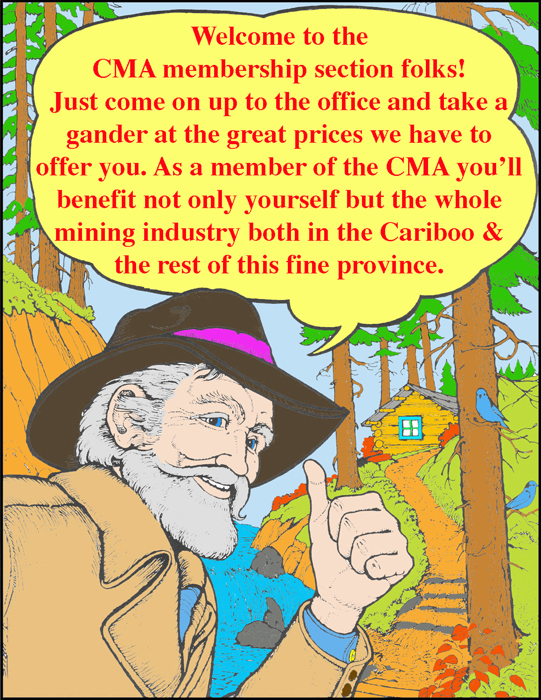 The Cariboo Mining Association invites all persons interested in hard rock and placer mining to join their association and help to support responsible mining and mineral exploration in the Cariboo. Gold Corporate Membership @ $300.00 per year. 6 free 1/4 page Ads in the CMA Newsletter there are 6 Newsletters per year. Your Name or Company Name in the Corporate Members Section of the Newsletter as well as on this Website. A Gold framed Certificate and Wallet Sized Gold Membership Card. Silver Corporate Membership @ $100.00 per year. 6 free business card size Ads in the CMA Newsletter there are 6 Newsletters per year. A Silver framed Certificate and Wallet Sized Silver Membership Card & CMA Logo. Bronze Individual Membership @ $20.00 per year. Includes e-mailed copy of the Newsletter 6 issues. For a Full Color Paper Copy of the Newsletter Mailed to you and Bronze Individual Membership @ $35.00 per year. ____Gold Corporate Membership @ $300.00 per year. ____Silver Corporate Membership @ $100.00 per year. ____Bronze Individual Membership @ $20.00 per year. ____ Bronze Individual Membership with a years subscription (6 copies) of the Full Color Paper Newsletter @ $35.00 per year. Your membership card(s) and receipt will be mailed to you. Thanks for joining the CMA! Please indicate your method of payment and send cheque or Money Order to the above address.